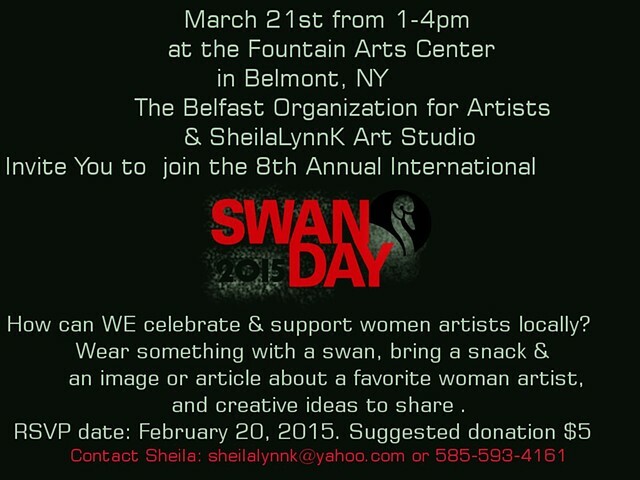 On March 21st from 1-4pm, at the Fountain Arts Center in Belmont, NY; The Belfast Organization for Artists and SheilaLynnK Art Studio will be hosting a local event to support the 8th Annual International SWAN (Support Women Artist Now) Day. Participants at OUR event are asked to wear something with a swan, bring a snack to share, creative ideas about how to celebrate this event locally in the future, and an image or article to share about one of their favorite women artists. RSVP date: February 20, 2015. Suggested donation $5 at the door. Not a local resident? Check out the Other SWAN Day 2015 Events list and locations.